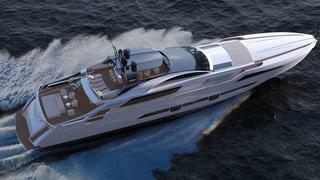 PERSHING 140 is a Loading... luxury yacht, currently being built by Pershing and to be delivered in 2020. Her top speed is 38.0kn. She can accommodate up to 10 people with 7 crew members waiting on their every need. She was designed by Fulvio De Simoni with Ferretti Engineering Department developing the naval architecture, and the interior design was created by Ferretti.